This is just simply a delightful flight of fancy. 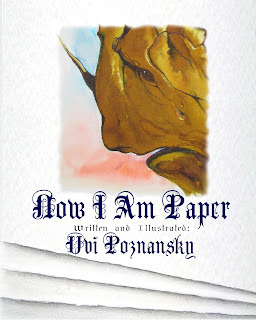 Uvi Poznansky's, Now I Am Paper feels like one of those classics that never grows old, and unless you make the mistake of growing up, no reader will ever grow too old to appreciate its story of love and loss, fear and hope, death and rebirth in a new form, as the old tree is transformed first into pulp and then to paper, the very paper from which the child reads this story. The story is golden, and the language is beyond price. Perfect for reading aloud to children, and if you haven't any of those little critters handy, to anyone who has a heart! This may be a children's book, but as an adult, I absolutely enjoyed reading it. It has a nostalgic feel to it that's all but missing in todays publishing world. This is probably one of the nicest children's books I've come across in recent times. Five stars and recommended.